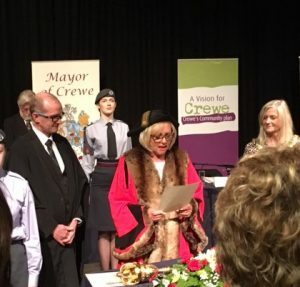 On Thursday 11th May 2017, we were honoured to attend the Mayor Making Ceremony at South Cheshire College to watch Councillor Diane Yates receive the Chains of Office and Civic Insignia, becoming the fifth Mayor of Crewe. With an interest in supporting homegrown charities, and improving the lives of children, Cllr Yates attended Climb’s Open Day in 2015 during Metabolic Diseases Awareness Week. We are honoured to have made an impact, leading to being selected as one of the chosen charities for 2017/18. We wish the new Mayor all the very best for her term of office and look forward to working together to help boost the profile of Crewe.